Recently, the Grow It Know It (GIKI) AmeriCorps VISTA service members assisted students, teachers, and staff of the Clarke County School District (CCSD) in organizing the Meals in the Middle fundraiser dinner. The meal, held Thursday, November 8, raised $770 for the UPENDO-One Kid at a Time organization. Due to the organizing efforts of the GIKI service members, 31 community members attended this meal and four CCSD teachers and over 100 CCSD students prepared and served the meal. Thanks everyone! 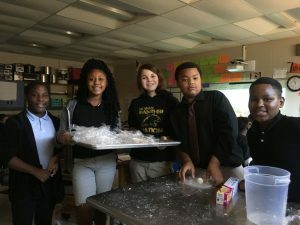 CCSD family and consumer science students at Hilsman Middle School prepare handmade tortillas for the Meals in the Middle fundraiser dinner. 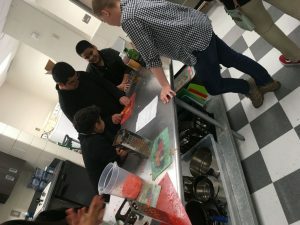 In preparation for the Meals in the Middle fundraiser dinner, service member Mackenzie Stewart trains family and consumer science students to make curtido, a Salvadoran cole slaw from produce grown in the school garden. Posted in Farm to Table, Food Systems, Kitchen Kids, School Gardens. Bookmark the permalink.